The sitar is one of the most well-known of Indian music instruments and has gained popularity both in India as well as the west over the last few decades.However, full details regarding the historical development of the sitar are not available. And its early history is shrouded in speculation. There is a wide variety of views regarding its origin ranging form those which consider it as an Indigenous instrument to others which regard it as an instrument that came in form central Asia. 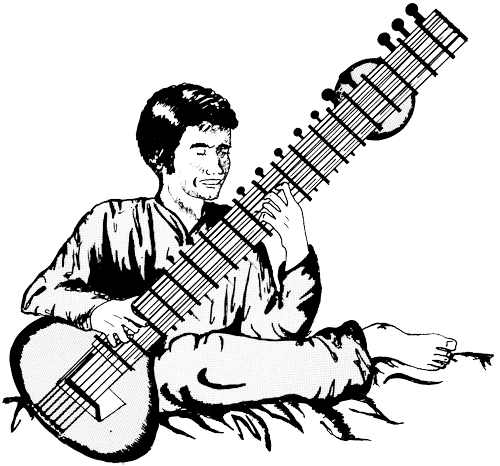 A sitar can have 18, 19 or 20 strings. Six or seven of these are played strings which run over curved, raised frets, and the remainder are sympathetic strings (tarb, also known as taarif or tarafdaar) which run underneath the frets and resonate in sympathy with the played strings. The frets are movable, allowing fine tuning. The played strings run to tuning pegs on or near the head of the instrument, while the sympathetic strings, which are a variety of different lengths, pass through small holes in the fretboard to engage with the smaller tuning pegs that run down the instrument's neck.